On 15 December 2005, following Brazil’s initiative, Kirchner announced the cancellation of Argentina’s debt to the IMF in full and offered a single payment, in a historical decision that generated controversy at the time (see Argentine debt restructuring). Some commentators, such as Mark Weisbrot of the Center for Economic and Policy Research, suggest that the Argentine experiment has thus far proven successful.Others, such as Michael Mussa, formerly on the staff of the International Monetary Fund and now with the Peterson Institute, question the longer-term sustainability of Pres. Kirchner’s approach. In a meeting with executives of multinational corporations at Wall Street—after which he was the first Argentine president to ring the opening bell at the New York Stock Exchange—Kirchner defended his “heterodox economic policy, within the canon of classic economics” and criticized the IMF for its lack of collaboration with the Argentine recovery. And of course, amidst all this, the NYT runs its inevitable ordinary Greeks admit that they are a nation of thieves, and therefore deserve the pain that awaits them piece…. Greeks seem to be engaged in national soul-searching these days, wondering whether traits they once found amusing might have led to many of their difficulties now. Some say their country may have been unprepared to join the European Union in the first place. Some focus on how European Union funds sent to Greece were spent on wasteful projects. Greece’s last administration hid the extent of its debt. But of course the right path toward the reestablishment of “a community… a collective society” is by the elimination of the right to collective bargaining and the phasing out of public mass transit! The playhouse he built for his daughter in the garden. What does he say – to himself, even to it – as he stands before it smoking yet another cigarette? He can remember the day he built it. His wife kept his daughter away from the back windows so that she wouldn’t see. It was the day before her third birthday and they had just moved into the place with the garden at back. One pane of the little plastic window in front cracked as he secured it in the frame, and there’s a little lintel piece that he never got around to installing sitting at its side. Inside the house, there are mostly unused toys. A kitchen set. Some balls. A little chair. He says to himself while standing in front of the house, Ah, this that you’re feeling comes one way or another no matter what happens. One way or another way, there will be a last time you look at that house. Such is the nature of things. We know this. We know when we’re hammering the nails and tightening the screws that one day some person, one day, will break the house down with a hammer and crowbar and set it out front on the day that they pick up large objects. So what if it is sooner rather than later? It will happen either way. He says this to himself, and his heart rises momentarily only to fall again. He is right, he is wrong. It doesn’t work. He says this to himself but refuses to say it, even under his breath, to the playhouse. I’m not sure that all of my US readers (sounds like the UK ones maybe can’t) shouldn’t try to help Helen DeWitt out if they can. 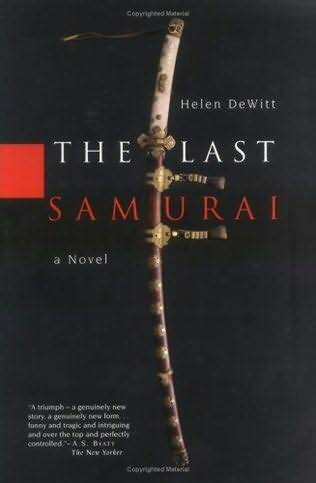 The Last Samurai is a very interesting novel; Helen is a very interesting novelist. The world needs more interesting, especially the literary part of the world. And she’s mentioned in a now-deleted post involving Neurathian isotype in her next book – which all AWP readers should understand and support.